Since October 2010 when King Abdullah II of Jordan proposed to the United Nations that the first full week of February each year be World Interfaith Harmony Week, people involved in interfaith globally have been joining together to celebrate this week. The week is based on Love of God and Love of the Neighbour, or based on Love of the Good and Love of the Neighbour, each according to a person’s own religious traditions or convictions. “Being Faithful In A Violent World” was the recent topic at the 4th Annual Interfaith Breakfast celebrated by the Interfaith Network of the City of Greater Dandenong during the United Nations World Interfaith Harmony Week 2015. This was a particularly relevant topic for the Interfaith Network as for almost two years it has worked in partnership with the City of Greater Dandenong on a “CHALLENGE Family Violence” Project to develop a diverse faith–based preventative resource. 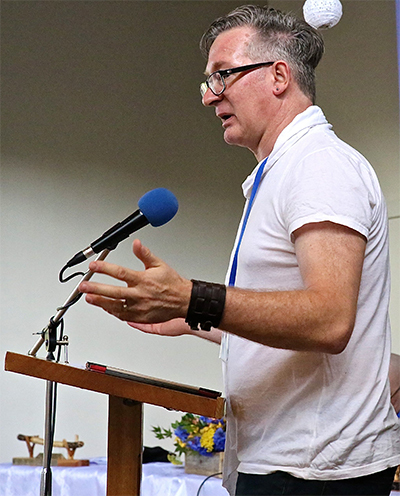 The guest speaker, Reverend Scott Holmes, an ordained Anglican priest who has assisted the Interfaith Network in this project, brought a wealth of experience having worked in health promotion projects designed to contribute to the prevention of violence against women by addressing the social attitudes and norms that are implicated in this violence. Those gathered at the breakfast were reminded that “being faithful in a violent world” calls all faiths to stand together in solidarity against all forms of violence. It calls us to be clear about the line between faith and culture. It calls us to examine the ways in which our faiths reinforce violence supportive attitudes and practices. And it calls us to personally and collectively practice hopefulness, peacemaking, justice and wisdom. In 2011, the first year of the UN World Interfaith Harmony Week, the Interfaith Network of the City of Greater Dandenong enjoyed lunch prior to their first monthly meeting for the year. In 2012, Mahamandaleshwar Swami Shankarananda from the Hindu tradition spoke on “Interfaith dialogue: An Evolutionary Imperative”. In 2013 Venerable Chi Kwang Sunim, a Korean Zen (Seon) Buddhist nun spoke on “Interfaith: Engaging in Meaningful & Significant Dialogue” while in 2014 Sherene Hassan, as a Director of the Islamic Museum, Sherene spoke on “A Faithful Heritage: Islamic Museum of Australia”.